This weekend, Speech Language Literacy Lab (SL3) will be travelling to Pittsburgh for the ASHA Schools Convention to present on universal language benchmarking in kindergarten. Early language abilities are directly correlated to reading comprehension skills in fifth grade. Many students can be adequate reading decoders, but start struggling in third grade when reading demands change. Universal language benchmarking in kindergarten helps identify these students years before they struggle, so that teachers can intervene early to prevent later difficulties. In diverse schools, many children speak different languages at home. Other students come from impoverished language environments. It is difficult to differentiate which students need specialized help to build language skills from which students just need a stimulating classroom environment. Monitoring language progress using using universal benchmarking three times a year eliminates the guess work. English language learners and children with typical language skills from language-poor homes will grow at or above the mean growth rate compared to the class. Children with specific language impairments will not. Regardless of the language environment at home, students who perform below their peers and attend class in English need to improve their English language skills to have equitable access to curriculum. Instead of waiting to see who will improve, educators can provide Tier 2 instruction to students who fall into the bottom quartile of the class on the universal benchmark immediately. We recommend using the Language for Learning direct instruction curriculum available at McGraw Hill. By monitoring progress bi-weekly with the tools in this curriculum, educators can identify which students benefit from Tier 2 support, and which students require more specialized Tier 3 language support provided by a Speech Language Pathologist. By monitoring progress and creating tiers of support, schools have the data to support that all children are learning. The KLBA is a universal benchmarking tool that assesses four areas correlated to future reading comprehension success and functional classroom performance: auditory comprehension, following directions, categorization, and narrative language. During the 2014-2015 school year, Speech Language Literacy Lab and Eastern Illinois University are expanding the normative sample size to 700 children. Schools participating in the research study will receive free testing materials and support. 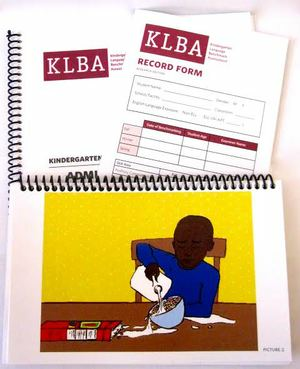 However, we are also offering our Research Edition KLBA (including Picture Prompt Book, Administration Manual, and Student Record Forms) at a discounted price this year. Educators who purchase this year will have free access to administrative online support. In addition, schools that purchase the research edition this year can receive a discount on the first edition of the KLBA when it is published.